Finally, always talk to your Doctor openly and honestly. 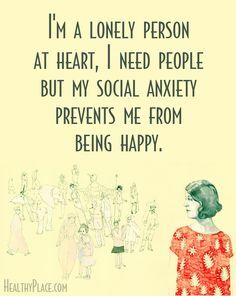 Take your medication and try to overcome your social anxiety so that you can experience the life that you deserve to live at the very fullest. Stressful socialsituations happen to everyone at some point in their lives and one out of every eight people know how you feel to be living with something much worse than ‘one social situation’, you are not alone at all and though there is little comfort in knowing that you aren’t alone , do know that you are understood. If you are still worried about your social anxiety be sure to check out this online self-help guide to overcoming social anxiety.